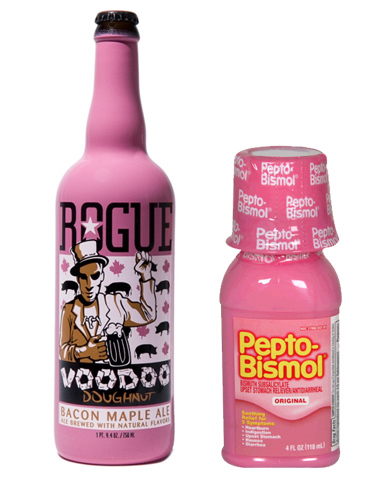 The warning signs are there, and there are plenty of them: The bottle, scarily similar to Pepto Bismol pink; the threat of a bacon maple flavor; the Voodoo Doughnut namesake. Really, the latter should be the true red flag -- "fun" as Voodoo Doughnut might be, it's never particularly good. Which brings us back to the beer. It's awful. So, so bad. It's so atrociously horrid, I'm not actually sure if it's beer or merely carbonated maple syrup. Maybe there's some alcohol in there too, who knows? With that said, it's kind of a an insult to maple syrup to compare this crap to it, isn't it? Some lovely Canadians recently gifted us a bit of maple sirup -- note the charming "i" -- and it was lovely. Really, this beer should probably be compared to Mrs. Buttersworth. Let's be entirely clear about this: There are no hints of doughnut, bacon, or voodoo in Voodoo Doughnut Bacon Maple Ale. There is something close to maple syrup. And carbonation. Maybe some hints of Bud. That's it, and it's awful. You need to be warned. A bottle retails for around $13. For $13 you could buy a couple of bombers of anything from Stone, a couple of good six-packs of a summer ale, or, probably, some actual maple sirup. With an "i". Any of those would be better. Do not make tonight a Rogue Voodoo Doughnut Bacon Maple Ale night. Vote for Rogue Voodoo Doughnut Bacon Maple Ale: It’s your civic duty!